I picked one, two, three pieces of rubber from my eye as Chris Forsberg threw his car into neutral after a tandem run at Raceway Park in Englishtown, New Jersey. His 350-horsepower Nissan was so sideways, it felt like the wheels were castors plucked from an office chair. I was riding shotgun, attempting to film it all. 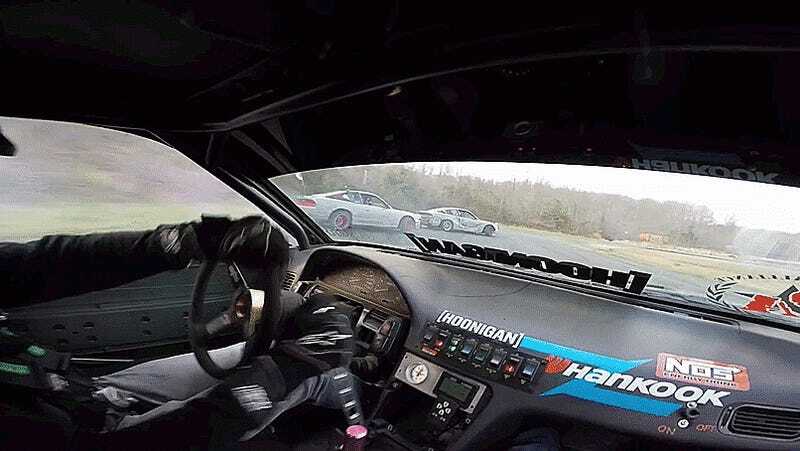 I operated the camera in Forsberg’s Nissan, and my colleague Jared Auslander mounted one GoPro to the bash bar on Hughes’ 240, and another to the rear window of a missile car. Rather than bore you with music, we just let the original audio tracks from the GoPros rock—especially the one from that sweet, sweet LS. Our friends at Gizmodo also loaned us a 360fly camera which we mounted to the top of Forsberg’s car, so that you can check out the run from every angle possible. Not a bad day at work.